Often times, these projections land on the right woman and reflect some or all of her pregnancy, labor and delivery, and mothering experience. The process of pregnancy and delivering a baby happen many times per day all over the world. The connection between mother and child that follows also occurs with regularity and is an accurate reflection of experience. However, the transition into motherhood is the only human event that is simultaneously miraculous and mundane. It may feel safer and simpler to acknowledge the beauty in it and forget the occasional terror and darkness that are also real. Modern medicine has clearly influenced the both the survival rate of women and newborns as well as mitigated associated challenges. Women have a variety of choices, and having a baby has turned into “an experience” that can be designed by pain management, home deliveries, or scheduled cesarean sections. Each approach seems to make a significant statement about values, identity, and parenting philosophy. It seems plausible that in this process we are attempting to distance ourselves from how animalistic birthing can be by turning it into something luxurious that we have control over. The truth, though, is that ultimately this process is out of our hands and has the capacity to go completely awry. Mothers whose experiences do not fit into the ideal (meaning their pregnancies were not pleasant or were dangerous, their deliveries were frightening or overwhelmingly painful, or something happened to their baby) find themselves in a position commonly associated with being a trauma survivor; they are alone. The juxtaposition of pressure to have a perfect pregnancy, a perfect (and courageous) delivery, be a perfect mother, and relish every second alongside the prenatal or postpartum trauma is a true collision of opposing experiences. Our bodies were meant to deliver babies, but sometimes they don’t work. Sometimes the body fails us, and in an effort to avoid the possibility that something as commonplace as childbirth could be out of our hands, it becomes simpler to ask the mother what she did wrong, to ignore her pain, or to impose our expectations of how it’s supposed to be. How does a mother contend with holding a baby for whom she is supposed to feel overwhelming love but for whom she instead feels nothing? What if her only fantasy is of escape versus of building a life with her child? What if she feels rage toward the baby? What if she is consumed by flashbacks and nightmares or replays chunks of pregnancy or delivery repeatedly in her mind? Her task is to absorb the projected experiences of maternal love and somehow integrate this information with how she is feeling in the moment. A possible comparison might be something like having been in a terrifying car accident and having the world tell you to enjoy it, seize the moment, and hold on to every second of it. Should you be incapable of doing so, there must be something wrong with you. You didn’t do it right. My goal here is to attempt to increase sensitivity to the complexities of birthing and the coinciding responses to it. A woman’s response to the birthing experience is multifaceted, even when there are no complications; with them, it can be devastating. 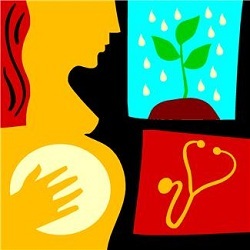 As therapists, treating postpartum depression may require treatment of prenatal or delivery trauma. As members of our society, we need to honor the range of possible experiences while offering nurturance to the mother as well as the child to provide open space for healing, possibility for connection between mother and child, and a smaller gap between expectation and experience. I have three children and each of my pregnancies was very different from one another. With the first I was so overwhelmed I did not know what to think or do. Everyone does expect that you are going to be so happy and excited, but all I felt was fear and apprehension but did not dare tell anyone that. With the second and third I was a little more relaxed, but still kind of in the back of your mind you are wondering if you are ever going to be able to live up these expectations that others have set up for you. It can be a pretty daunting experience! you would think that women would stop all of this comparison stuff, they have been through it all themselves so they should know better than the rest of us how much it can bring them down, why are they intentionally sabotaging another mother? Being a mom is hard work! And we talk about it like it is going to be the most natural thing in the world, but I think that when we all decide to stop and get honest about it, for most of us it did not always come naturally. It was always a bit of trial and error and sometimes tears, but you have to keep on trying to get it right. And sometimes even then you are not sure that you have it all right, but again, you don’t keep up, you keep on going. So we need to start admitting that it is hard work and that it is not always fun and games but it is worth all of that hard work. But we have to stop making those moms who are willing to say out loud just how hard it is feel bad and make them feel like they are the ones who have it all wrong. I think I saw a new book out somewhere that addresses the very things that Delores is talking about, like how moms never will say how hard it is because they are afraid of what others will think about them. It is filled with anonymous anecdotes and stories about the trials and tribulations of being a new mom. Anyone else heard of this or know a name of it? never easy dealing with things that are SUPPOSED to happen with you.add to that the hormonal changes going on inside and it seems like giving birth and the whole period of pregnancy and afterwards is a major challenge. there are societal,social,biological,physical and psychological parameters that can make this lovely journey sour.what is needed is support and care. In response to Joely’s query on April 11th, I found the book by Naomi Stadlen “What Mothers Do: Especially When it Looks Like Nothing” a fantasitc book when I was in the first throes of motherhood. I don’t think it’s the book you refer to, but it is full of comments from mothers about the issues being a mother thows up from the many years she has run a group for new mums. She recently published a second book “How Mothers Love: And How Relationships are Born” which I’ve bought but not had the time to read yet.